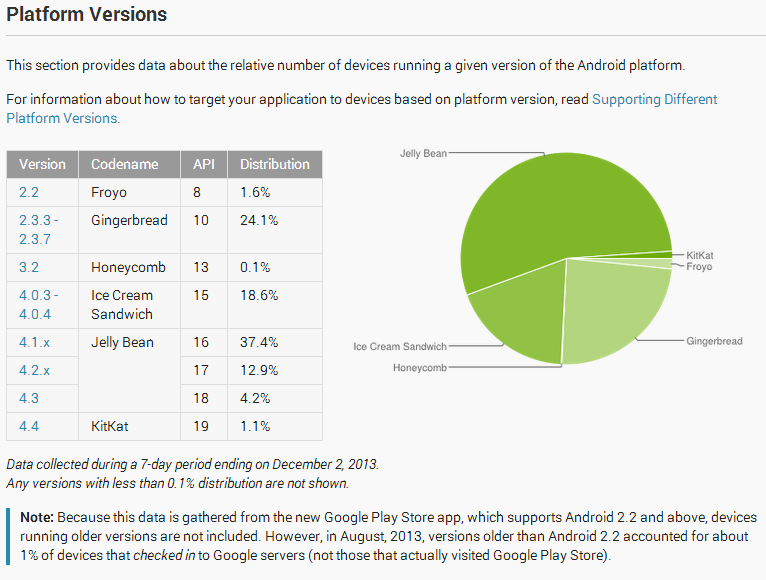 It's that time again - Google has updated the developer dashboard with new platform distribution numbers. Following a predictable trend, KitKat has eked out its own 1.1% niche, Jelly Bean (API version 16-18) is going strong at 54.5%, putting it further over the mark it reached last month, running on over half of all devices that have checked in to the Google Play Store in the past two weeks, while Gingerbread's grip continues to slip, decreasing to 24.1% from 26.3% last month. Honeycomb meanwhile is sticking at a negligible 0.1%, while ICS has dropped 1.2% to 18.6% from last month. Froyo has made another tiny decline, now running on an unlucky 1.6% of devices, down from 1.7% last time around. As always, the page also includes helpful charts measuring screen size and Open GL versions on devices included in the distribution chart.